An uncommon decorative map of North America. Carta Geografica Dell' America Settentrionale. 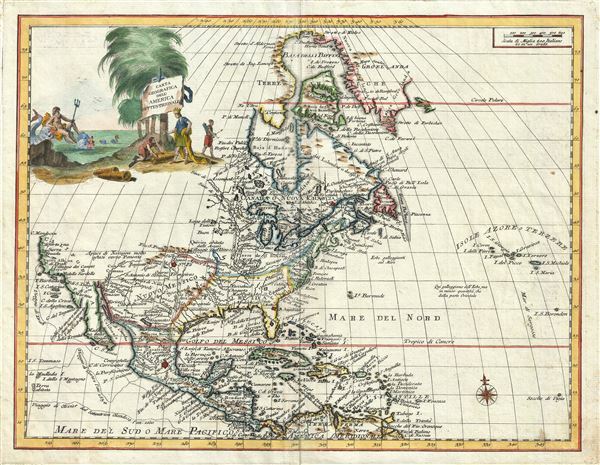 An attractive 1740 map of North American by Giambattista Albrizzi. Based upon an earlier map by Guillaume Delisle, this map covers all of North America from Baffin Bay to Panama and the Spanish Main and from the Atlantic to the Pacific. The western coast of North America is mapped as far north as Cape Mendocino, beyond which no explores had yet ventured. The presentation of California is of exceptional interest. Despite the discoveries of Eusebio Kino the early 18th century in favor of Baja's peninsularity, many mid-18th century mapmakers still debated the fact. Here Albrizzi commits to neither idea, instead leaving the northern extremis of the Gulf of California open and unexplored. He does however, including a secondary gulf further north on the Pacific side of the Baja peninsula which he notes, in Italian, 'has not yet been discovered.' The Sierra Nevada mountains are noted just north of Nova Albion, the lands claimed by Francis Drake for the British crown in 1759. Although an Italian map the political geography leans heavily in favor of the French, possibly due to Albrizzi's borrowing of the map from Delisle. The British colonies are restricted to a narrow strip of land between Charlestown and Maine and limited on the west by the Appalachian Mountains. Spain naturally controls New Mexico, Mexico, and California. The remainder is dominated by France, including much of modern day Texas, Florida, Carolina, Georgia, all of the Great Lakes, the Upper Mississippi Valley, and most of modern day Canada. France's claims to Florida, Carolina, and Georgia date to colonial efforts in the 16th century, but as in the present case, persist on maps until the treaties at the end of the French and Indian War. Albrizzi's incorporation of a large decorative cartouche in the upper left quadrant is of special note. The graphic, which includes Poseiden alongside stylized American Indians, was most likely drawn by the well-known Italian artist Giovanni Battista Piazetta (c. 1682 - 1754). Piazetta's graphic elements are in this case rather innovative in that they attempt to include both allegorical (Poseidon) and descriptive elements. The transition to more descriptive cartouche work thus illustrated marks important advancement in 18th century Italian school cartographic publishing and set the stage for the later work of Antonio Zatta, among others. Library of Congress, Geography and Map Division, G3300 1750 .L4. Phillips (Atlases) 594.